This time of year, shoppers get a little frantic trying to complete their Christmas shopping and yet still want to purchase gifts online AND get them by Christmas! It happens every year and this year is no different. Now of course you need to know WHEN your order will ship and from WHERE. I generally ship the day following the placement of an order. 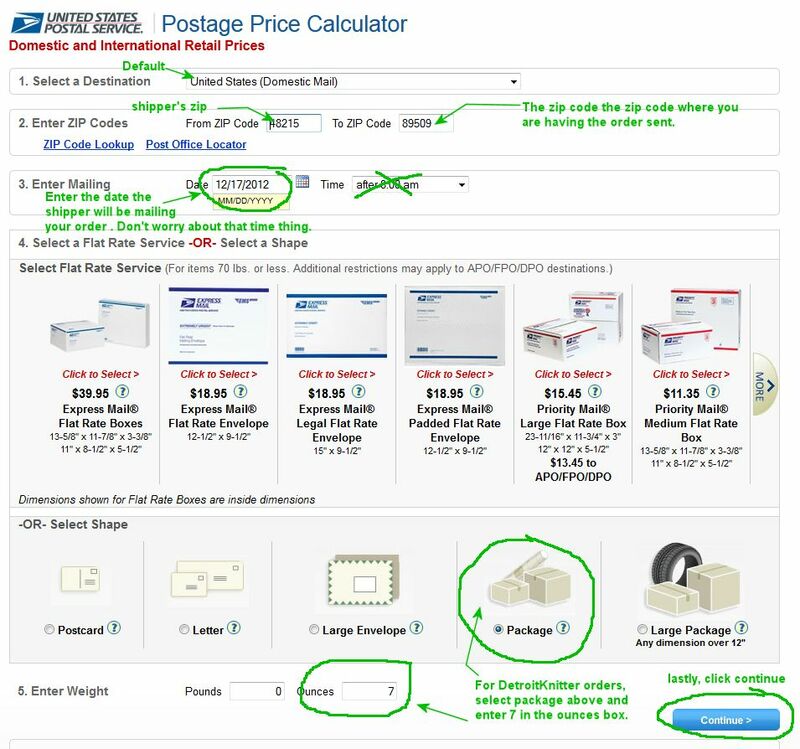 Here is the USPS postage and ETA calculator - remember that at Christmas time it might take the postal people an extra day or even two to get the high volume of packages delivered. Below are a few visuals to help you out (click on the pics to enlarge)... In this example I will ship a package to zip code 89509 in Reno, Nevada on December 17th. Since I'm shipping everything Priority after the 17th, the post office is indicating an ETA is the 19th. That seems a little fast for the Christmas rush doesn't it? I'll see how long it takes by the delivery confirmation. So far all of my shipments have arrived earlier, on time or within 1 day after the ETA shown using this calculator. My post office system is terrific here in Detroit; remote areas experience delays though. After you click "continue", you'll get a new screen with shipping options and prices. I circled the ones I use the most. 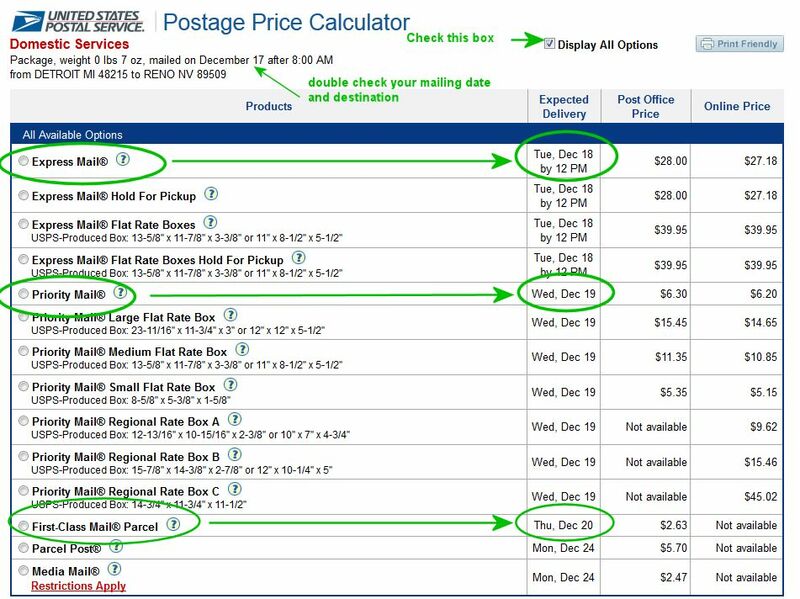 I appreciate your reply concerning calculating postage but there is one thing that I cannot figure out. I am selling fabric and a lot is over 13 oz which then means it goes either priority or parcel post. How can you determine either without knowing the location to which you are shipping, or do you just calculate the farthest zone? I can't even begin to know how to calculate foreign shipping. I got burned on a shipment to Denmark the other day. Hi Nancy ~ Ah, yes Priority can be trickier. Yes, I would use the zone that is furthest from you. You can always announce that you will refund the difference over X dollars or set up a custom listing for that person on Etsy and send a revised invoice on Ebay. Here are a couple of links to help you figure out how much to charge for priority and international shipping. INTERNATIONAL: This one allows you to download the information by zone (You'll see the links for "Downloadable Pricing Files" https://www.usps.com/ship/first-class-international.htm? THESE RATES ARE ASSUMING YOU ARE SHIPPING USING EITHER ETSY SHIPPING OR EBAY SHIPPING SINCE THERE IS A DISCOUNT. The cost to ship at the USPS counter is higher for calculated shipping.